The public meeting scheduled for November 30th has been POSTPONED until Wednesday, January 10th, 2018 with an open house at 6:30 PM with a presentation 7:00 PM at the Goulbourn Recreation Complex (Hall A), located at 1500 Shea Road. 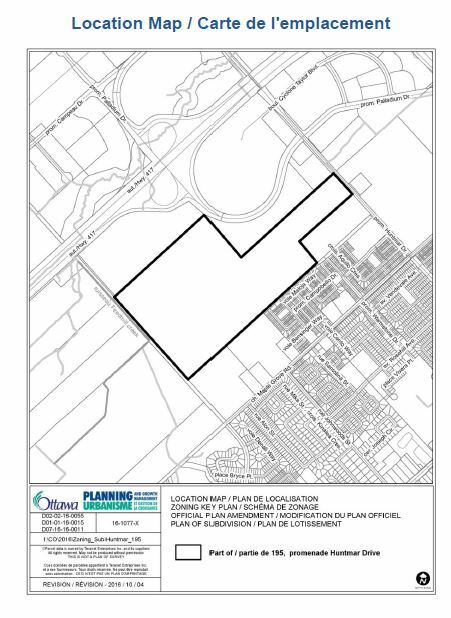 The public meeting is regarding a proposed plan of subdivision by Shenkman/Cavanagh for the property at 195 Huntmar Drive, which is located west of Huntmar Drive and south of Highway 417 as shown on the Location Map (File No. : D07-16-16-0011). The Plan of Subdivision proposes the development of approximately 1120 detached, townhouse, stacked townhouse, and low-rise apartment residential units. The subdivision also includes blocks for commercial development to accommodate a range of small scale retail, restaurant, and service commercial uses and automobile dealerships. A secondary school (OCDSB) and parks, including the Kanata West District Park, are also proposed. For additional information you can visit my website here. Please note that in the future a revised Draft Plan of Subdivision will be available on my website and on www.ottawa.ca/devapps. For more information, please contact myself and City Planner Louise Sweet at 613-580-2424 ext. 27586 or Louise.Sweet@ottawa.ca. For additional information you can visit my website here. Please note that in the future a revised Draft Plan of Subdivision will be available on my website and on www.ottawa.ca/devapps . This week at City Council the zoning application for the Richcraft Homes development at 1620 and 1636 Maple Grove Road was approved. This site is located south of Maple Grove Road, west of the Carp River and north of the Grant Shopping Plaza (Lowes). The zoning amendment they submitted is to permit a residential subdivision for proposes 945 units that include a mix of single-detached, townhouses, back-to-back townhouses, stacked townhouses and low-rise apartments. A school, a commercial block and three parks are proposed. A holding symbol on a portion of the land along the Carp River can only be lifted once conditions related to Carp River restoration works have been met. The lands will be rezoned but the holding provision will be carried forward until conditions are met. The development applications for this site were submitted in 2004 and public consultation was undertaken during that time. There was a concern expressed by some in the community that there was not adequate time for the community to provide comments on the zoning application. Concerned residents requested the item be deferred to the following Planning Committee and given the concerns I did put a motion forward requesting a deferral. However, my motion was not supported by the committee and the committee approved the zoning application with my dissention on the report. I also dissented on the report at City Council where it was approved. Starting on Wednesday, November 15, 2017, Johnwoods Street will be permanently closed to vehicular traffic from Maple Grove Road to Rosehill Avenue and will be rebuilt as a multi-use pathway for pedestrians and cyclists. This work will add a safe and accessible recreational amenity, more greenspace and direct connections for pedestrians and cyclists in your community. The pathway will also enhance privacy and livability for nearby residents by reducing vehicle traffic noise and headlight glare. For more information on this project, including history regarding the decision I encourage residents to please review the documents available on my website. I have recently received inquiries from residents regarding the Community Park to be constructed in the Blackstone Subdivision. The large community park in Blackstone will be 3.25 hectares (8 acres +/-) and will service a large area of the Fernbank community and will be located southwest of the intersection of Rouncey Road and Groningen Street. The park will be constructed by the developers working with the City of Ottawa and the trigger for the park to be built is 50% of the building permits for the area it services. The developer has advised that they aim to start construction in 2018. As with any new park, there is an opportunity for public comment on the park features. A plan is in the process of being developed and then it will be circulated to the community for their comments. The public will be able to comment on the type of park features to have in the park. At this time the following amenities are being considered however please note these could still change: double tennis court; intermediate and full size soccer field; small skate park, puddle rink, splash pad, parking lot and shade shelter. It was brought to my attention that one of the developers was sharing the Fit Plan for the park at their sales office, however this is not the final plan and should not have been shared at this time to the public. For more information on the park development process please view the following image from page 50 of the City’s Park Development Manual (2nd Edition) the outlining the steps involved in designing and building a new park. I am happy to invite residents to attend a Public Meeting regarding a proposed plan of subdivision by Mattamy Homes Ltd. for the property at 5505 Fernbank Road. The Plan of Subdivision proposes the development of approximately 950 residential units, with 425 detached dwellings, 27 blocks for townhouses, and one block for condominium apartments or stacked units. The subdivision includes lands for an elementary school and a high school. Two 1-hectare parks are proposed as well as pathway blocks to provide connections to the Monahan Drain and throughout the site. For more details on this development please click here. On Tuesday, August 22nd, the City`s Planning Committee will be considering a Zoning By-law amendment proposal for Zoning – 5615 Fernbank Road (formerly known as 5786 Fernbank Road) to permit a residential subdivision with school site, Emergency Services facility and transit station. The site is a vacant 12-hectare parcel within the Fernbank Crossing subdivision. It is bounded by Fernbank Road to the south, Cope Drive to the north, Robert Grant Avenue to the west and vacant land to the east that will be developed as future phases of the Blackstone subdivision The lands form the fourth and final phase of the Fernbank Crossing subdivision. The Fernbank Crossing subdivision received draft approval on February 2, 2012, and previous phases have been registered, with the third phase of development currently under construction. This final phase of the Fernbank Crossing subdivision proposes the development of approximately 107 detached dwellings, four blocks for townhouses, an elementary school site, paramedic post and transit station with a park-and-ride facility. To view the report in full, please click here. For questions or to provide comments, please contact myself and City Planner Kathy Rygus Kathy.rygus@ottawa.ca or 613-580-2424 x 28318. The City of Ottawa has received applications for a Draft Plan of Subdivision, as well as a Zoning By-law Amendment to permit the construction of the next phases of the Blackstone subdivision. The subject lands are located in the southeast corner of the Fernbank Community and are approximately 42.5 hectares in size and are currently vacant with some vegetation and trees. Mattamy Homes and Cardel Homes proposed to develop the subject lands with approximately 950 residential dwellings. The plan of subdivision proposes approximately 425 lots for detached dwellings and 27 blocks for townhouses. The townhouses are primarily located along the future collector streets and in the southerly portion of the subdivision, close to Fernbank Road. One high density block for condominium apartments or stacked units is proposed at the southeast corner of Fernbank Road and Rouncey Road. The Blackstone development will incorporate a number of open space amenities including, two 1-hectare parks hectare parks, one of the southwest corner of the site and one in the southeast. Pathway blocks will provide connections to the Monahan Drain, the parks, and the two school sites. A stormwater management block will be located in the northeast corner of the site, immediately south of the Monahan Drain. An Ottawa Carleton District School Board elementary school site is proposed at the southwest corner of Cope Drive and Rouncey Road, and an Ottawa Catholic School Board high school site is proposed at the southeast corner of the subdivision, adjacent to the existing commercial development. The proposed street network is based on the Fernbank Community Design Plan. Through the subdivision Cope Drive, Tapadero Avenue, and Rouncey Road will be extended. A roundabout will be located at the intersection of Cope Drive and Rouncey Road. I am pleased to see these next phases of development proposed as it includes additional amenities that will be beneficial to the community including the extension of Cope Road, a safer pedestrian access for area residents to access the commercial shopping area, additional parks and pathways as well as some proposed schools. To provide comments by July 31 or for questions please contact my office and City Planner Kathy Rygus at Kathy.Rygus@ottawa.ca or 613-580-2424 x28318. A public meeting will also be held at a later date which will also provide another opportunity for the public to provide input as well. For additional planning documents regarding the application please visit here. On July 11th the City’s Planning Committee approved the zoning report for Tartan’s EdenWylde Subdivision located at 5970 Fernbank Road. The report will not go forward for approval to City Council on July 26th. The zoning application is to permit a residential subdivision containing 326 single detached, 26 semi-detached, 233 multiple attached and 135 low-rise apartment dwelling units and one park, as detailed in the plan of subdivision. I supported this zoning as it reflects the plan of subdivision that has been presented to the public. While this site is located in Councillor Moffatt’s ward, we have been working together on development applications in the urban boundary in his ward as they have an impact on the residents in ward 6. I would like to thank Tartan Homes for their co-operation in ensuring that we follow the plans presented to the public. They had requested a change to the plans to permit a higher density in one location and while that was a minor request in nature, I felt the community may be concerned with not being consulted on the change and therefore Tartan agreed to follow the existing plan. To provide comments by July 14 or for questions please contact my office and City Planner Kathy Rygus at Kathy.Rygus@ottawa.ca or 613-580-2424 x28318. A public meeting will also be held at a later date which will also provide another opportunity for the public to provide input as well.